This volume is part of the series on "Chemical Thermodynamics", published under the aegis of the OECD Nuclear Energy Agency. 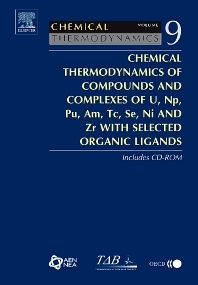 It contains a critical review of the literature on thermodynamic data for compounds of complexes of oxalate, citrate, EDTA and iso-saccharinate with uranium, neptunium, plutonium, americium, technetium, selenium, nickel and zirconium. A review team, composed of five internationally recognized experts, has critically reviewed all the scientific literature containing chemical thermodynamic information for the above mentioned systems. The results of this critical review carried out following the Guidelines of the OECD NEA Thermochemical Database Project have been documented in the present volume, which contains tables of selected values for formation and reaction thermodynamical properties and an extensive bibliography. Contributed by: Wolfgang Hummel (Chairman), Paul Scherrer Institute, Switzerland, Giorgio Anderegg, Swiss Federal Institute of Technology (ETH), Switzerland, Linfeng Rao, Lawrence Berkeley National Laboratory, U.S.A., Ignasi Puigdomènech, Swedish Nuclear Fuel and Waste Management Co. (SKB), Sweden, and Osamu Tochiyama, Tohoku University, Japan. Critical review of all literature on chemical thermodynamics for compounds and complexes of oxalate, citrate, EDTA and iso-saccharinate with U, Np, Pu, Am, Tc and Se, Ni and Zr. Valuable reference source for the physical, analytical and environmental chemist. Scientists and engineers working in Radioactive Waste Management. Also physical, analytical and environmental chemists and Nuclear Fuel cycle scientists. OECD Nuclear Energy Agency, Data Bank, Issy-les-Moulineaux, France. (Series Editor and Project Co-ordinator) OECD Nuclear Energy Agency, Data Bank, Issy-les-Moulineaux, France.